Why do I don’t buy third class e rickshaw? What is called third class e rickshaw? Third class e rickshaw is one e rickshaw which is using low quality motor, controller, shocker, and all other cheap price spare parts. When driving this kind of e rickshaw, All parts are repaired within six months. Even the dealers can give you so called guarantee of six month, they won’t keep their words. Why do they not keep their words? Because they cant earn from this low cost e rickshaw. Because the total cost is low, they sell at low price. Then also they can’t offer guarantee of six month. If do, they will lose. They are comparing the cost only. So it seems like a zero-sum game. So compared to third class e rickshaw, what is first class e rickshaw? 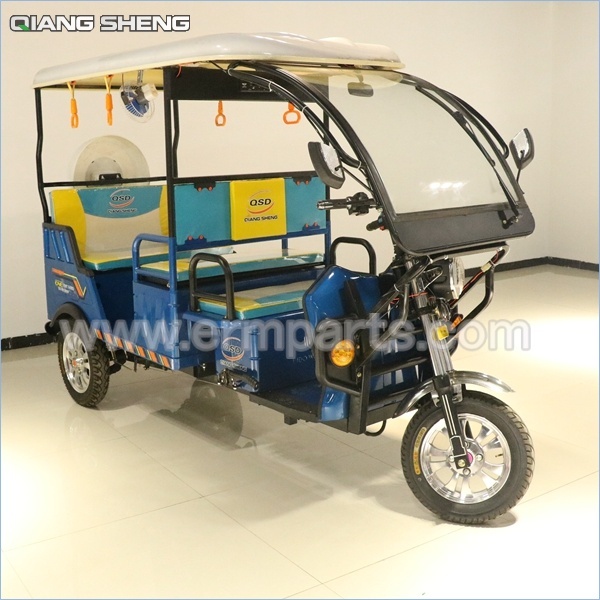 First class e rickshaw is one e rickshaw which using high quality motor, controller, shocker, and all other simple parts also keep same quality standard. When driving first class e rickshaw, you also need to do regular maintenance. For example: motor oil to be changed each 5000km, battery electrolyte to be added each month, all kinds of lubricating oil to be added according to need. Frankly speaking, guarantee of six month is hard to keep in reality. But if quality is good enough, Offering quality guarantee can get better fame than ads directly. So who can give quality guarantee and also keep low repair rate, they can change that situation to be a positive-gaming. So if you want to be an e rickshaw dealer, the key is to select out factory who is producing e rickshaw with real good quality. In the next article, I will introduce you how to select out good e rickshaw factory. Attached is one pretty model e rickshaw picture.